Oh, what a sweet cup and saucer! I love the soft pink and the sprinkle of posies. You find the prettiest sets on your travels! I got myself a tray just like yours today, only in black. My plan is to paint it white. Somehow black seems too harsh to set delicate teacups on. Thank you for sharing your new treasure with us and have a lovely week, my friend. 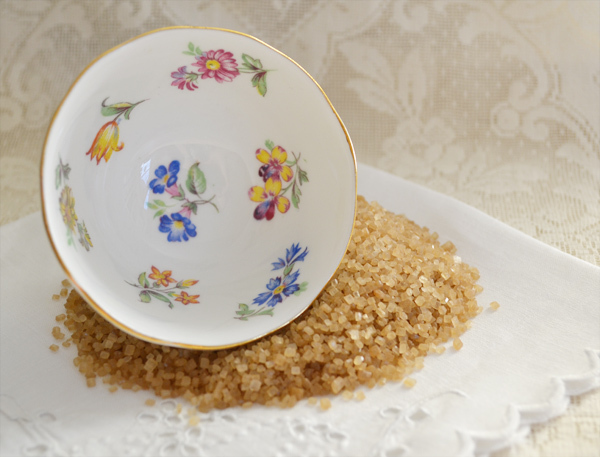 I love your pretty tea cup...and you use the same sugar as me! Adorable and sweet tea cup..wish I was having my green tea in such a cutie...and with you! Thank you for hosting and have a lovely week. 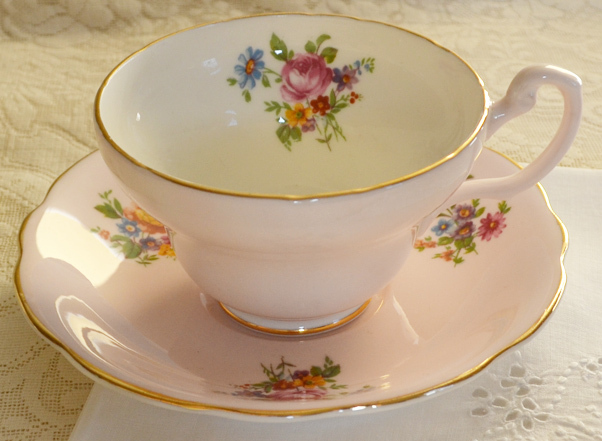 Your teacup is gorgeous- such a sweet pink! I love your little tea tray, sure makes everything taste better that way! So, I didn't realize - you are glutton intolerant then? 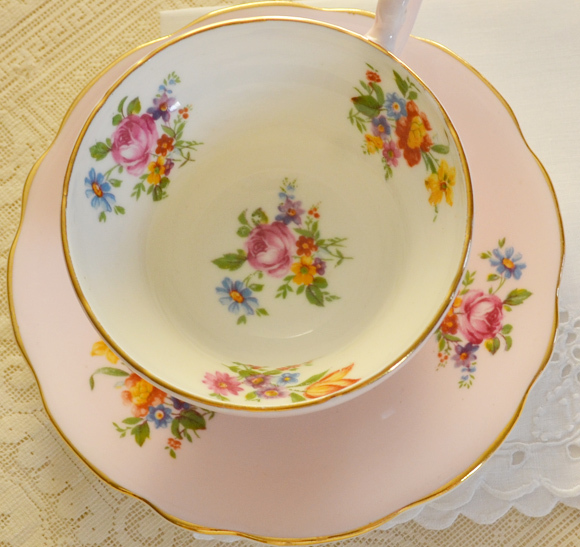 Your tea cup is simply elegant with spray of flowers and with pale pink ground. Happy 4th blog anniversary by the way. Hi terri, beautiful cups - I only drink tea, no coffee for me and I love to drink it out of a special cup too! what a treat! The tea cup is so pretty I love how the flowers are inside and right at the bottom of the cup too! if such wonderful tea settings are a reason for therapy, I am ready for that. I love the sweet creamy and pink atmosphere you created. Just the right touch of flowery decoration inmidst a winterly white surrounding. Thats White Living at its best, serene but with some soft color. 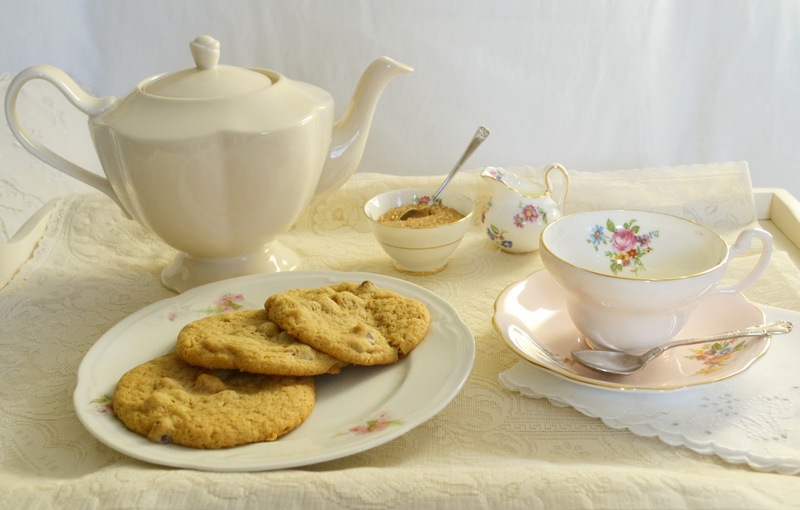 The tea cup is wonderful and the little creamer/sugar-set is perfect for that. Would love to join you for this tea. Thank you for sharing and for hosting this nice blog party. I just love that cup and saucer. The pale pink comes across as "soothing" to me, as does everything else in the beautiful photos! The mini sugar and creamer is so cute, too. I haven't participated in Tea Cup Tuesdays in SO long. Maybe I'll do a re-post, if that's okay! Beautiful, soft and makes me want new (old) china! You keep finding lovely treasures, dear Terri! 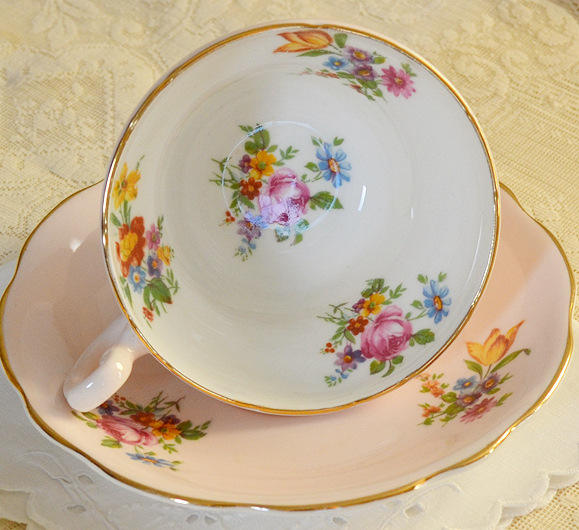 The tea cup and saucer are so beautiful with the sprinkle of posies on that lovely pink! 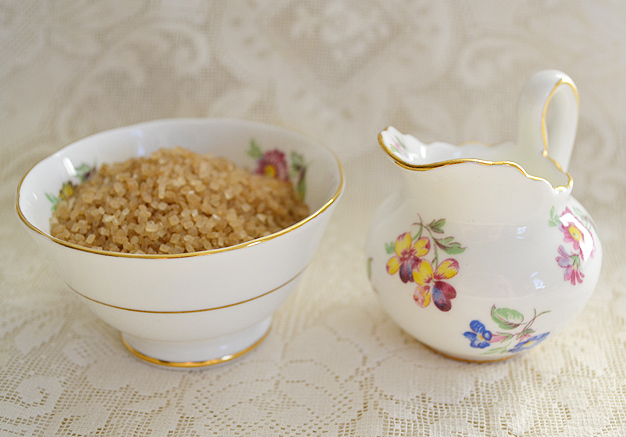 But the creamer and sugar are another beauty, a perfect match to it! I always enjoy your posts Terri, as you never fail to make them inviting. I came across a breakfast tray a bit different then yours, however passed it to my Niece who had really wanted it. Hi Terri. Just lovely! A pale blushing pink! And your tea for one is so invisitng! Lovely! Thanks for sharing and hosting! oh how pretty!!! love the photos Terri!!!! Happy Tea Cup Tuesday!!! Your cup is absolutely gorgeous! Love the soft pink and also the sweet cream and sugar! You do such a beautiful job of setting up vignettes! Hi Terri, Your teacup is just beautiful! Love your white tea tray and teapot too. You've created a lovely vignette. 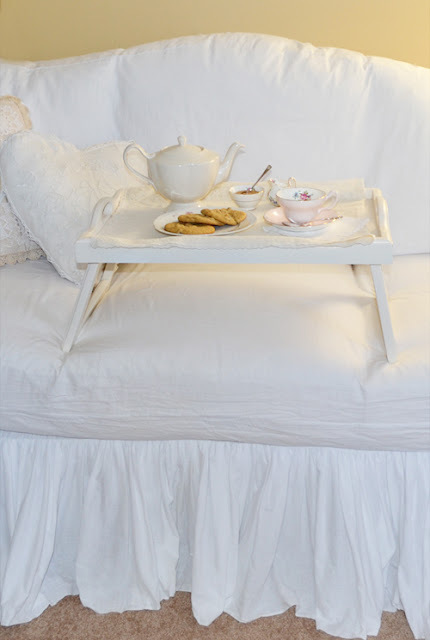 Pretty tea cup and tray. And, I LOVE your sofa! So pretty! Thanks Terri for visiting me. 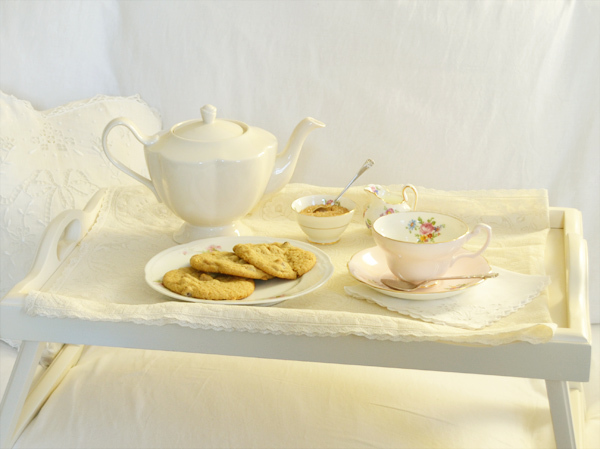 The tray with the tea and biscuits looks very lovely, and would be a nice way to enjoy your afternoon tea. You asked where I live to be enjoying cherries... I live on Waiheke Island, New Zealand. 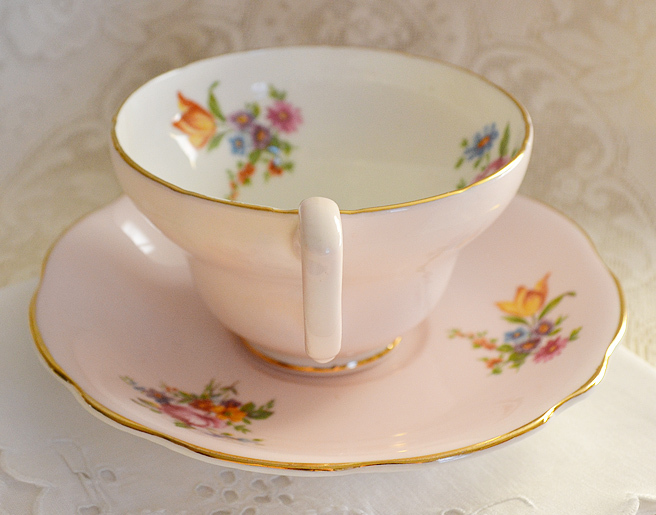 I forgot to say how very pretty the teacup is, in my favourite colour of pink. Terri, thank you for stopping by my blog, I love visitors!! I forgot to say that the teacup was Royal Albert, Jacobean......it's hard to find yellow cups. Of course that could be because my daughter loves yellow ones too! 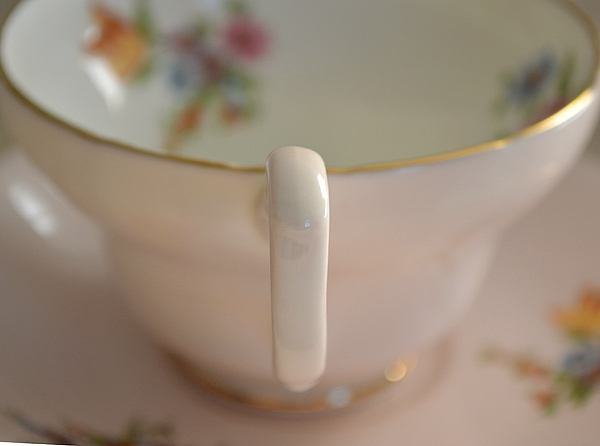 I can't wait to share more teacups......it will fun to join in your Tuesdays! Eeek! I am a new follower and you are tempting me into a new collection. Lovely pictures! 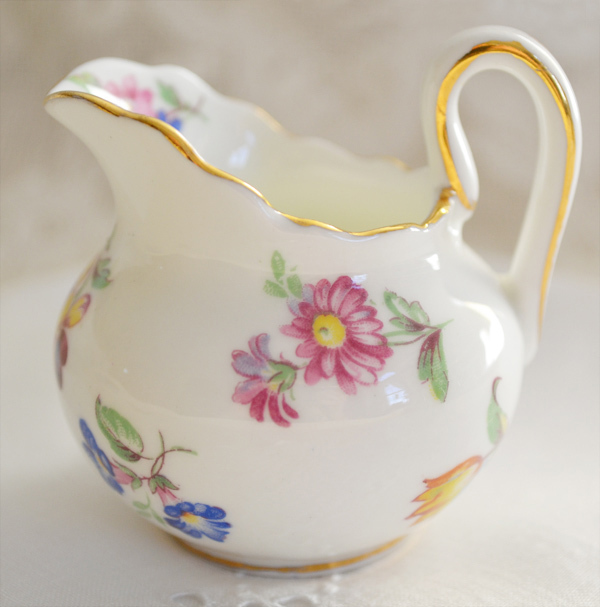 Hi Terri..awesome...such a delightful cup..I totally adore the soft pinks too..and yes it is very gorgeous..the floral patterns make it really sing! beautiful! i love the turbinado sugar too..very pretty amber colors. Your photos and your imagery is sublime and full of harmony.. love your trays..your inner joy really shines through! 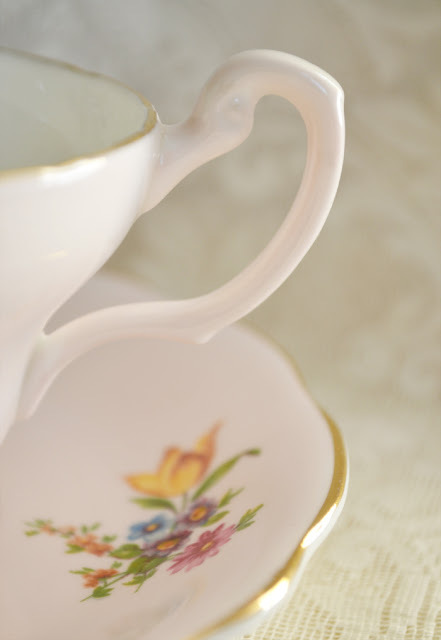 It is amazing how something as simple as capturing images of tea sets can spark such magic! Thanks for continuing to share your beauty.. and knowledge of tea cups! 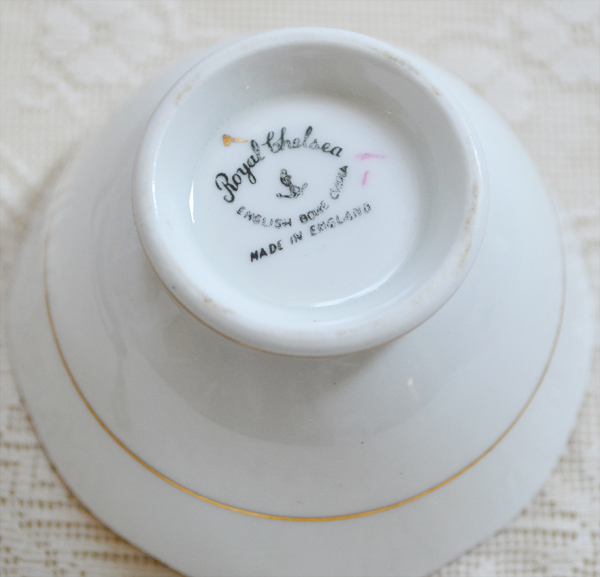 Lovely Foley teacup! I love the pretty powder pink and cream color with the floral bouquet. I am also sharing a Rose Foley teacup this week for Sandi's 3rd Anniversary. Thanks for hosting. Wishing you a lovely week. Oh Terri - what a delight to have tea at your home! I will definitely be here each Tuesday for these parties. 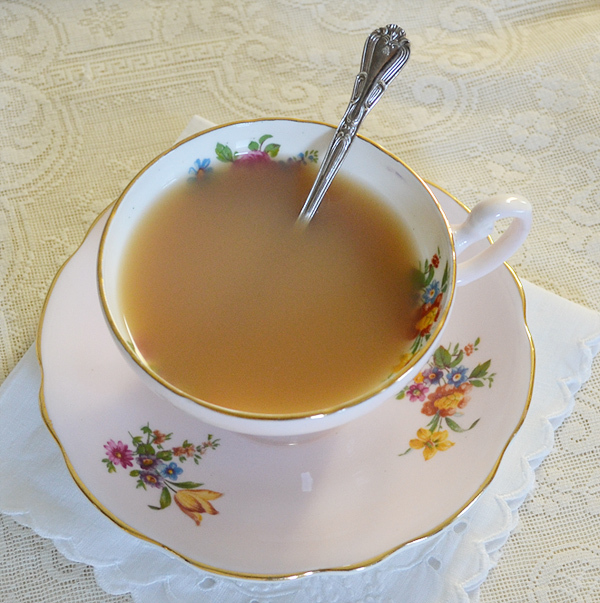 Bone china is the ONLY way to drink tea but sadly it is served mostly in mugs nowadays. I despair at the lost style. Correct about the bone china is the only way to drink tea and that goes for the mugs too. They are okay as long as they are the bone china..
Just beautiful Terri. Reminds me that I should get my cups and saucers out of the cupboard! Hi Terri, thanks so much for your visit and for following me! You and Becky have inspired me, so I got out my camera and posted about my newest St. Vinnie find. I hope you don't mind my coming back to link up my crochet tea cup giveaway. Swing by and comment for your chance to win! Beautiful, I have never seen so many posts with beautiful tea cups! 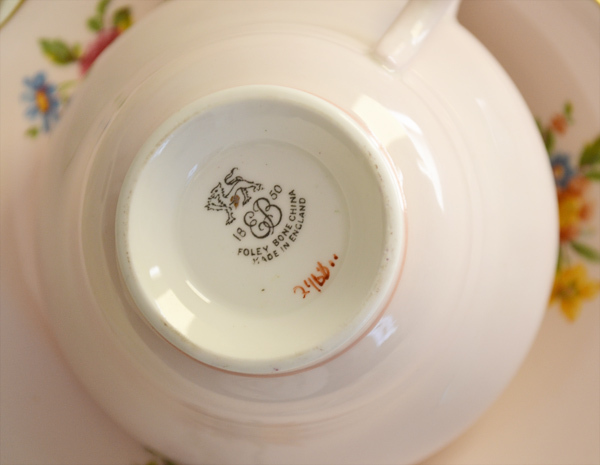 My mother collects tea cups, as well as sugar and creamer sets, I will have to refer her to your blog for a visit! What a darling set, dear Terri-so lovely in pink! I try to catch up, but a bad cold have knocked me down! I don't think you need therapy! If you do, I guess we had better all sign up! I love love love the pink cup. Ooooo! Terri! I loved your teatime this week! Sneaking back into Blogland for a visit and hoping to post SOMETHING - even though I should be creating a lapbook project on the Underground Railroad for my students next week! Now - about your Foley cup - there are four of them (or very like) at my neighborhood teashop and I can't afford even one just now! No luxury spending for this little girl, I'm afraid. But, seeing them in person - I love the creamy texture of the outside color. And - gluten free chocolate chip cookies??? Where THAT recipe - I would love to have it! Blessings to you - always an inspiring visit when I stop by to see what you're up to. Thank you for your precious visit and comment-- you've made my day! I'm so glad that the GYB party was such a success for you-- I'm hearing that from so many people-- that's what I had hoped for!! A dream come true-- right!! Wow Terri. What a darling little tea cup. I inheritted some from my Great Grandmother when she passed away last year and your post makes me want to pull one out and have a cup of tea. [url=http://www.iystwowgold.com#wowgold]wow gold[/url], Initially, i like my own games gold! We have acquired him or her for roughly a whole year these days which are excellent cute and even fine. They go with quite a bit in doing my armoire, so they seem to be definatley a smart investment. What i too absolutely adore: this little feet are usually form of enormous and even diverse, i absolutely appeared to be worried first who games gold will make these seem actually bigger, though in which entirely was not the way it is! They also develop on your ft . and created our bait appear some finer. The things take part in absolutely adore pertaining to my own games gold: not too durable- they can really should not be maxed in the rain so it drains much of the coloring, knowning that is true for hail far too. But when you operate good these folks discuss mainly because substantial associated with a challenge. Moreover, convey them socks just like you don't they are begin to scent a tad, and can purpose bruises. In spite of this, the positives definatley surpass that side effects, so i needed reccomend these folks definitely. Managed to get a lot of these [url=http://www.gw2golds.de]gw2 gold[/url] this coming summer we Really like him or her. They may be interesting and even sylish and may bring all of them with my personal jeans and my own sweat jeans. To start with I have done imagine that we were looking at any scam regarding their expense but they're DEFINITELY worth the item. The only way who will get aggravating might be that the flap on the side helps to keep continuing to fall. That i still recommed these even though! i seriously liked the direction they appeared, however , perhaps purchasing a couple of shapes and sizes less significant next typical, the particular ft fitbut the actual leg-portion ended up being much too large. i thought overall i'd have the ability bring [url=http://www.gw2golds.de#gw2gold]gw2 gold[/url] at their comprehensive position,but way too much "slouching" designed that hopeless.